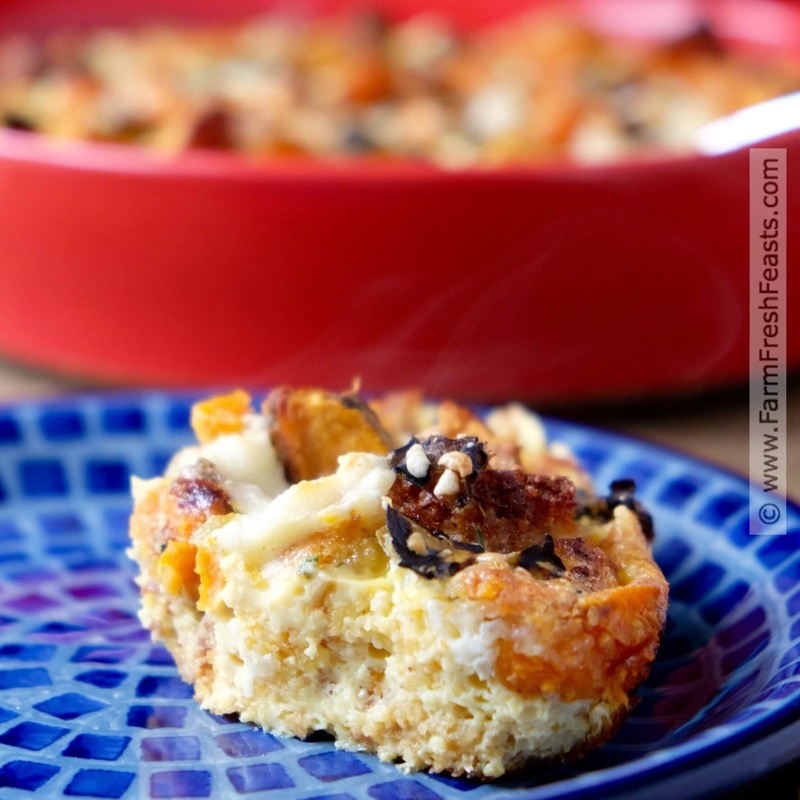 A vegetarian and gluten free breakfast casserole made from roasted sweet potatoes and Hatch chiles in a cornbread and custard base. Topped with crumbled queso, this is a spicy way to start your day. When I get an idea for a recipe I'll think up both an omnivore version and a vegetarian version. The resulting products seem to vary widely--like my Easy Artichoke Arugula Pesto Burrata Pasta and my 5 Ingredient Butternut Squash, Sausage and Burrata Pasta or my Cheddar Apple Onion Bacon Pizza and my Apple Gouda Pecan Pizza. Today's recipe is no exception. 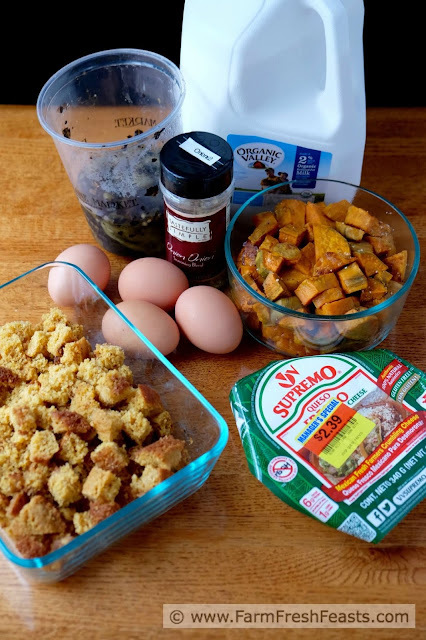 My initial idea was to use roasted sweet potatoes from the Community Supported Agriculture (CSA) farm share to make a gluten free breakfast casserole. My omnivore version was posted last year. I used gouda cheese and turkey sausage to make a colorful and hearty dish. You can find the recipe here. I wanted to try a vegetarian version and wanted to keep it gluten free just because there are plenty of bread-laden breakfast casseroles out there, so I used cornbread. My cornbread recipe is not as sweet as some Southern ones I've had, and does not use wheat flour--only corn meal--so it is gluten free if your cornmeal comes from a place that keeps an eye on cross contamination. You can find my cornbread recipe in this tamale pie post or this tamale pie post, because I change things up, yo. Spicing things up with some roasted Hatch chiles kept it interesting. Note: If you don't have a freezer stash of roasted Hatch chiles, no worries, check out the Hispanic section of most grocery stores. You can find 4 to 7 ounce cans of chopped green chiles in various heat levels. Choose whatever you feel comfortable with. My local grocery store gets truckloads of chiles up from Hatch, New Mexico and fires up the roaster in the parking lot. I pick up a couple of quarts each August. I use some in salsa verde and freeze some for recipes like this. You could also sub a roasted poblano if you've got some lying around looking to stay out of trouble. For more recipes using Hatch chiles, please see my Hatch Chile Recipe Collection. For more recipes using sweet potatoes, please see my Sweet Potato Recipes Collection. These collections are part of the Visual Recipe Index by Ingredient, a resource for folks like me eating from the farm share, the farmer's market, or seasonal produce from the grocery store. Want to know how to use this blog? Click here. Preheat the oven to 400 degrees Fahrenheit. Spray a 10 inch round shallow casserole pan with oil spray or the non-stick spray of your choice. 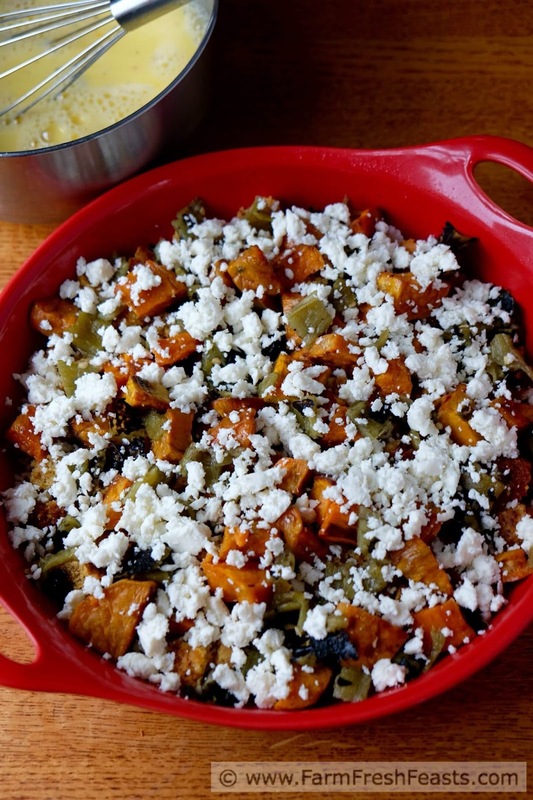 Scatter sweet potato cubes and chiles across the bottom of the prepared pan. Top with cornbread cubes and queso. Set aside. In a medium bowl, whisk together remaining ingredients. Bake for 35 to 45 minutes or until puffed and lightly browned. Serve warm, with salsa on the side if you like. Your veggies are itching to get into trouble. 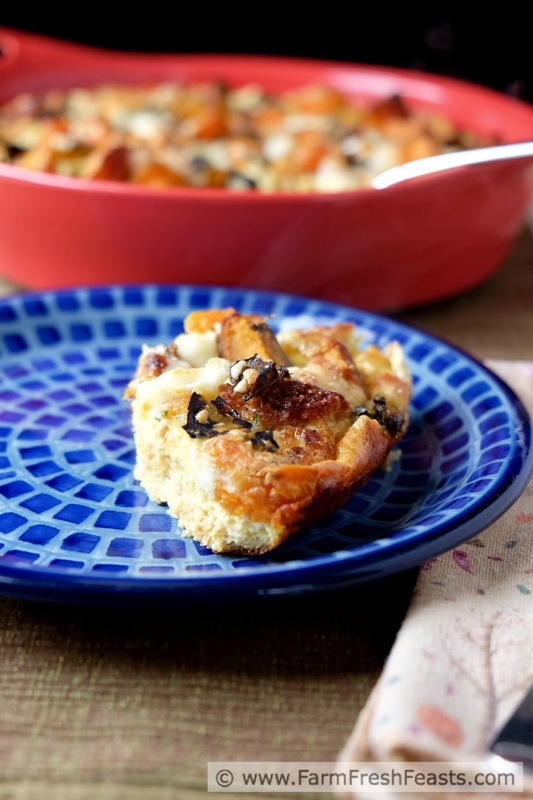 Best get them into a nice soup if not this breakfast casserole! This looks really good! Personally, at the moment I'm overrun with delicious sweet potatoes from my CSA. I'm off this coming Saturday too, so I'm thinking brunch?! 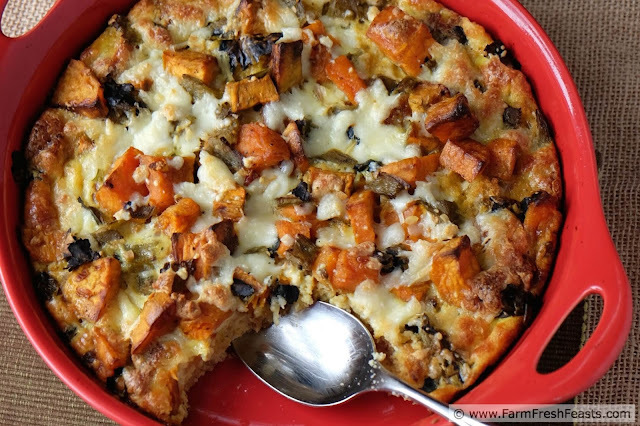 Brunch sounds like an excellent plan for your sweet potatoes. And when you get more, next week I'm sharing a neat Sweet Potato Monkey Bread recipe!